Will Jerome Corsi Use The Investigation Into Robert Mueller's Framing Of A Veteran Against Him? Former FBI Director and current special investigator of the ever eluding Russia probe against President Donald Trump, Robert Mueller, is under investigation, according to a letter released by the Tennessee Bureau of Investigation. Author Jerome Corsi knew of the investigation, and that has some wondering if he might use that investigation against Mueller or wait and see what happens with it following his rejection of a Gestapo-style push by Mueller to get him to accept a plea deal of perjury. Mueller... stands accused of framing a Georgia man on gun charges after the man traveled to Tennessee for an arraignment hearing of a friend in April 2010. 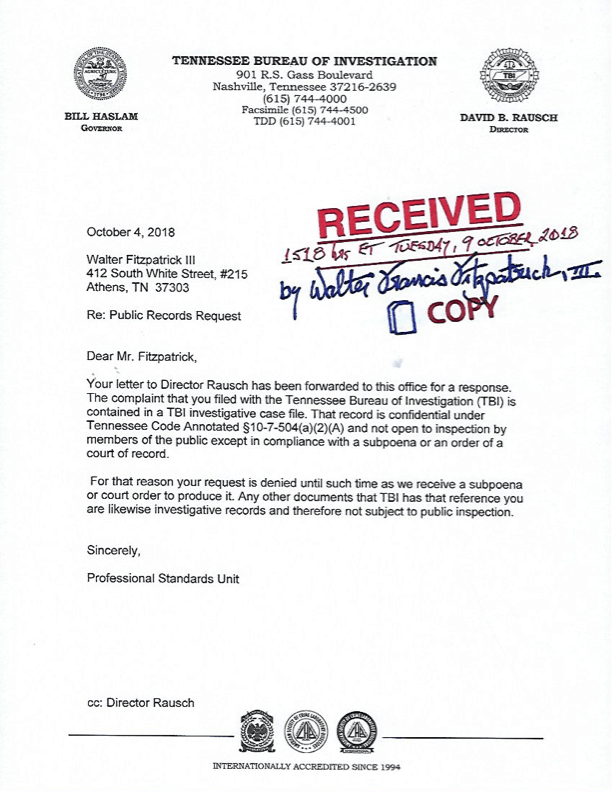 Nearly a decade later, the case against a man who was sentenced to four years in federal prison for what appears to be lies that emanated from Robert Mueller’s office continues to be “under investigation,” and the state of Tennessee doesn’t seem to want to make the public aware of the truth. The Tennessee Bureau of Investigation confirmed in a letter that there was an investigation involving Robert Mueller. The criminal complaint against Mueller is with regards to framing US veteran Darren Huff on phony gun charges and even the Special Agent in Charge at the time committed perjury in the attempt to frame the veteran. Huff was sentenced in May 2012 to four years in federal prison for what could be considered a “thought crime,” a term introduced in George Orwell’s novel 1984, in which supreme government power punished individuals for thoughts of anger, resentment, protest or disobedience against its figurehead, “Big Brother,” even if such actions were never carried out. On April 20, 2010, Huff traveled to Madisonville, TN, the county seat of Monroe County, to attenda court hearing for CDR Walter Francis Fitzpatrick, III (Ret. ), who on April 1 had attempted to carry out a citizen’s arrest on Gary Pettway, the Monroe County grand jury foreman. Pettway did not acquiesce to Fitzpatrick’s demand that he turn himself in to authorities, and Judge Carroll Lee Ross directed sheriff’s deputies to arrest Fitzpatrick instead. While the county claimed in indictments issued against both Huff and Fitzpatrick that Pettway was “a juror,” Tennessee Deputy Attorney General Kyle Hixson now claims that the foreman is not, and has never been, a juror in a discrepancy which has not been reconciled. Eastern Tennessee is well-known for its endemic government corruption dating back decades and is ranked first in public corruption by some sources. Huff had been stopped and questioned on his way to Madisonville by Tennessee Highway Patrolmen and, upon their suggestion, locked his legally-owned firearms in the toolbox attached to the back of his pickup truck before proceeding into town, a fact confirmed by the Knoxville News Sentinel. Like many others, Huff was not permitted to enter the courthouse to observe the hearing and therefore patronized a restaurant across the street with an acquaintance, former Marine Sgt. William Looman, who spent the rest of the day with Huff before parting company that evening to return home. Monroe County officials made no arrests, despite the presence of between 100 and 200 local, state and federal law enforcers, including a SWAT team and bomb-sniffing dogs, all of which turned out to be unnecessary. Ten days later, without provocation, Huff was arrested by federal authorities while driving through Knoxville, TN and charged with “carrying a firearm in interstate commerce with the intent to use it in a civil disorder” and a second firearms charge. Boston Mobster Whitey Bulger Killed in Prison – Sources Say He Was About To Out FBI Officials, Maybe Robert Mueller? On Monday, author Jerome Corsi rejected a plea deal from Mueller, and blasted him for using "Gestapo" tactics to pressure him into the deal. Corsi told NBC producer Anna Schecter that a plea agreement would involve the author of pleading guilty to one count of perjury. “I’d rather sit in prison and rot for as long as these thugs want me to,” he told Schecter. Instead of accepting a plea deal, OAN’s Emerald Robinson reports Corsi will file a criminal complaint against Mueller with acting Attorney General Mathew Whitaker. As reported Friday, Corsi revealed that he has been negotiating a potential plea but declined to comment further on the matter. He said on a YouTube show earlier this month that he expected to be charged with lying to federal investigators, though he said at the time that he was innocent of wrongdoing. Mueller’s team questioned Corsi as part of an investigation into Stone’s connections with WikiLeaks. American intelligence agencies have assessed that Russia was the source of hacked material released by WikiLeaks during the 2016 election that damaged Hillary Clinton’s campaign. Mueller’s office is trying to determine whether Stone and other associates of President Donald Trump had advance knowledge of WikiLeaks’ plans. Now, according to Patrick Howley, Corsi knows about the only standing criminal complaint against Mueller at this time, the one in the hands of the Tennessee Bureau of Investigation. Writer Jerome Corsi, who rejected Mueller’s plea deal in the Russia collusion case but is still under Mueller’s microscope, actually knew about the case in question years ago, before the criminal investigation opened in Tennessee. Mueller as FBI director was accused of working with a blogger who wears a hammer and sickle Communist hat to build the law enforcement presence that led to the man’s arrest on gun charges. The question should be raised as to whether or not Corsi will point to the ongoing criminal investigation into Robert Mueller and then add his own complaint in with it to the Justice Department. Clearly, Robert Mueller is wasting the people's money and hasn't turned over a single piece of evidence that involves "Russian collusion." President Trump, it's time to shut down the witch hunt and spare yourself and America this charade posing as a search for justice. For more on Corsi, Roger Stone and Alex Jones spoke about it over the holiday weekend. Previous Just How Many Muslims Won Political Office In 2018? The Numbers May Surprise You! Next Why Would Someone Like Boston Celtics Player Kyrie Irving Hate Thanksgiving?